I have hunted with my dad all my life. Growing up, it was a tradition to spend several days getting all the gear together, cleaning guns, and preparing for the best weekend of the year with my dad. This past fall, it just so happened that Austin Siewert, with Kicking Bear, was in the process of finding mentors to lead youth on the Kicking Bear Youth Hunt. He reached out to me about mentoring and I was quick to agree, looking forward to sharing my knowledge and experience and continuing the tradition that I grew to love. 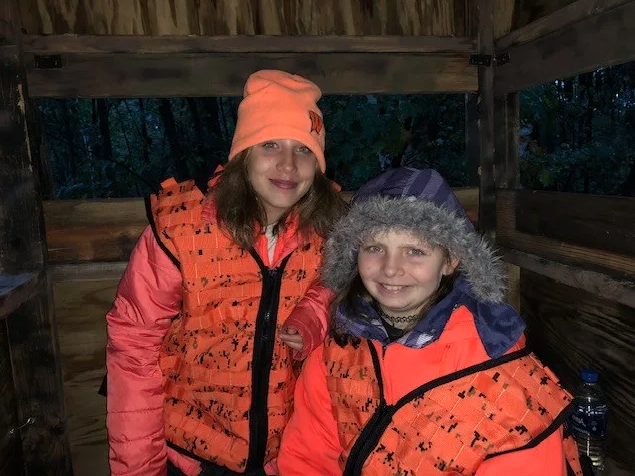 As the details for the youth hunt were finalized, Austin informed me that due to the shortage of female mentors, I would be the only mentor to have two mentees, both of whom were from the Boys and Girls Club and had little experience with the outdoors, much less guns and hunting. At first, this made me nervous—to be a mentor of two young girls who knew nothing about each other. 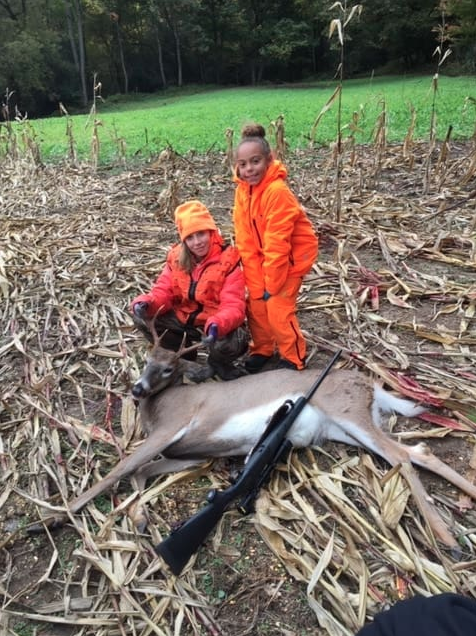 However, as the hunt got closer, I began to gain confidence in myself and in my ability to guide my two mentees to success on the hunt as well as guide them in their faith. One day before the youth hunt, all the mentors and mentees met in the Gander Outdoors parking lot to travel to the hunting land together. That evening was the first time I met one of my mentees, Trinaty. I had previously met Kaylie at our gun sight-in a week before. Both girls, timid at first, quickly began talking and laughing with each other, as well as with Austin’s mentee, Takobie. 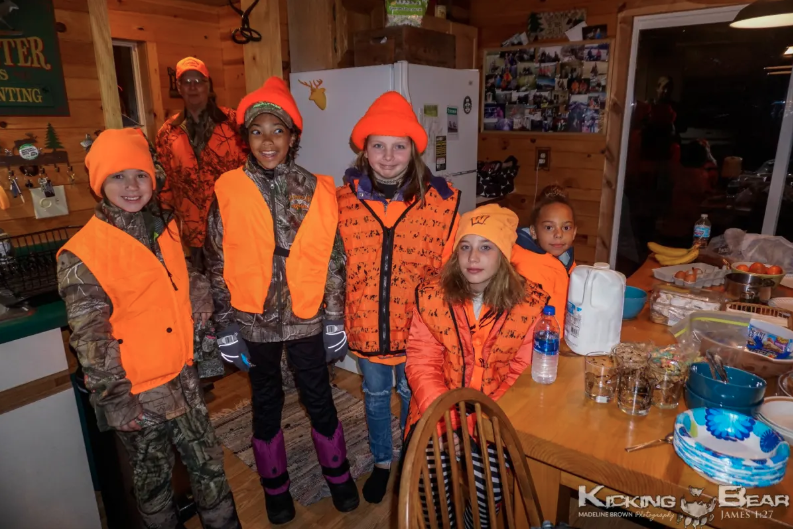 When we arrived at Living Waters ~ Weddings, Retreats & Cabin Getaways, the place we were blessed to be able to stay, sleep, and eat at during the youth hunt, we had a few hours to explore, fish, and prepare for the morning hunt. Due to state law, we were only allowed to carry one rifle, so we had to decide who would shoot first. In the girl’s cabin, morning came fast and early. Between excitement and laughs, Trinaty and Kaylie got ready for the cold morning ahead. When the rest of the girls were ready, we headed out to our tree stand. On the way to our stand, we spotted two does right off the path we were on, making the girls even more excited for the day to come. When we finally got settled into our stand, the girls nodded off as I took the first watch, promising to wake them at any sight of deer. After sunrise, Trinaty woke up and we began to talk about everything and anything, including hunting, family, God, and life, passing the time quickly until we headed in for lunch. That morning and evening, we did not see any deer. That evening, when all mentor/mentee groups reconvened at our meeting place, we got to see the deer that the other mentees had been blessed with, which had our hopes high for the next morning’s final hunt. Morning again came early as the girls woke and got ready for another chilly hunt. In order to increase the odds of both Kaylie and Trinaty getting a deer, we decided to split them up. Kaylie stayed with me, and Trinaty went with Melanie, another mentor whose mentee had already gotten a deer the day before. We returned to our stand and remained hopeful that we would see some deer as the sun rose that morning. After the sun rose enough to see the cornfield in front of us, a shot rang out in the distance. I texted Melanie to see if the shot was Trinaty’s. She responded with yes and that they were waiting a bit before they got out of the stand to recover her 8-point buck (below). I was excited for Trinaty and was then even more hopeful for Kaylie to see some deer that morning. A few hours passed when I turned around to see three doe walking in the woods behind our stand. I whispered to Kaylie to slowly turn her head to look. Once we were both looking at the deer, the doe had locked onto our scent and began snorting and stomping at us before they all ran away. 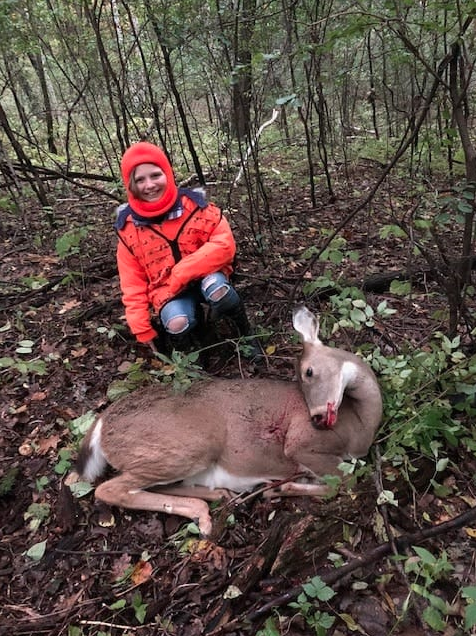 I was disappointed that they fled and began to tell Kaylie that sometimes deer scent us before we can get a shot off, but suddenly, a big smile grew on her face and she whisper-screamed that she saw a deer right below our stand. I told her we had to be quiet and slow to set-up, so this deer did not hear us and run away like the others. After we got the gun ready and Kaylie was positioned just right, I told her to make sure she had the perfect shot before she took the safety off. When she was ready, the shot rang out and the deer turned around and ran back into the woods. She set the gun down and was very confident in her shot, stating that she remembered to follow the leg line up for the perfect shot, just like Ray Howell told her to do. After a bit of waiting, we got out of the stand to track her deer into the woods. We found blood below the tree stand and began to follow the blood into the woods until we spotted Kaylie’s doe a short distance from where she shot it (below). Now, we just had to wait for the Ranger to come pick us and the deer up to bring back to the cabin. The pure excitement in Kaylie’s voice was something I will never forget as she shared her hunting story with her new-found friends of the other mentees. After returning to the cabin, I was then also able to see Trinaty’s beautiful 8-point buck. The Kicking Bear youth hunt is something that I will never forget, and I believe I can say the same for Trinaty and Kaylie. I asked them to share their favorite part of the hunt with me, and this is what they had to say: “I loved all of it. My absolute favorite part was when I shot my deer. I didn’t think I would get it, but I did. I also loved fishing with Abbi and having fun with all the other mentees… I can’t wait to go again” (Kaylie). “I loved being able to shoot my deer and staying in the nice cabin with the other mentees” (Trinaty). Becoming a mentor on the hunt was one of the best decisions I have made, changing not only my life, but my mentees’ lives as well. After the hunt, Kicking Bear launched a new mentorship program in the La Crosse area that my mentees and I plan to take full advantage of. The mentorship requires the mentor and mentee to do an outdoor activity together at least once a month for a minimum time span of one year. 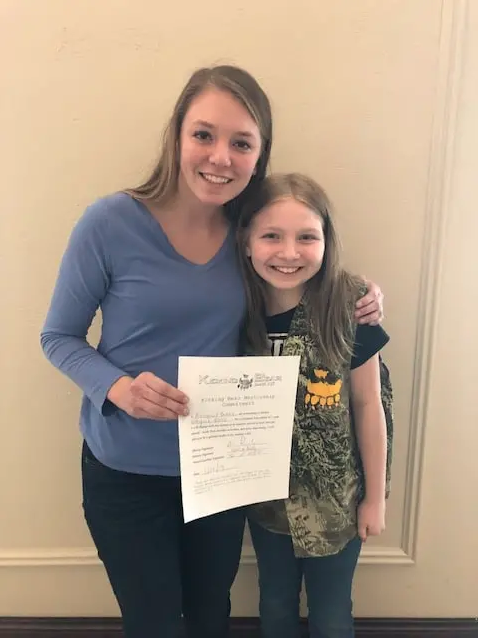 On Thursday, January 24th, Kaylie and I signed this mentorship agreement together (below), and we are excited to continue growing in our friendship and faith. To me, this experience and opportunity is not something that is given to just anyone. God Himself chooses a special person to be sent into a kid’s life to help guide them and give them someone to come to in times of need.